The Quality Hotel Grand, Steinkjer is a conference hotel in the heart of Steinkjer, with 113 hotel rooms, 7 conference rooms, a restaurant and bar. Organise conferences, meetings and events for up to 400 people. We are a cash-free hotel. We serve a big breakfast buffet with many organic and healthy options – a proper hotel breakfast! Breakfast is always included in the room rate. Quality Hotel™ Start is a basic breakfast, for our guests who need to check out before our usual breakfast times. Quality Hotel™ Start should be ordered in advance at reception and you can also ask for it as a take away. There is public parking around the hotel, for which there is a charge, from 8am – 5pm on weekdays. Parking spaces cannot be reserved. At Quality Hotel Grand Steinkjer, we know that sometimes all you want to do is close the door to your room and crawl into bed – and that's why we offer room service. We deliver food and beverages direct to our guests' room, during restaurant opening hours. Contact our reception for more information or to place an order! Bring your best friend along! 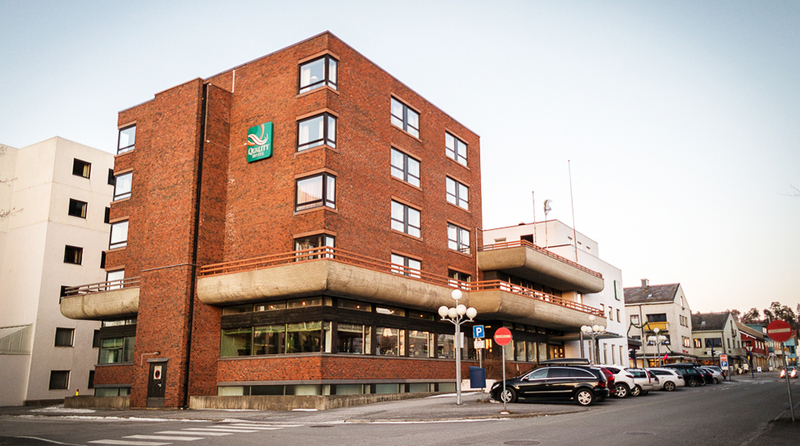 Pets are always welcome at Quality Hotel Grand, Steinkjer for a fee of NOK 250 per stay. Please remember to tell us when you make your booking, so we can do our best to meet your needs! All our hotel rooms and communal areas have free WiFi. Drop by reception for the access code or log in using your Nordic Choice Club membership number.